At-home hair removal is a less expensive way to reduce the growth of embarrassing hair all over the body. You won’t have to make appointments twice a month to have hair removed, and there’s no loss of modesty when you remove the hair yourself. Hair can be removed in the comfort and privacy of your own home. While I wouldn’t want to attend a hair removal party, there are plenty of women who invite their friends over, have a few drinks, and get blasted with the laser. It probably dulls the pain! Make no mistake, hair removal hurts. 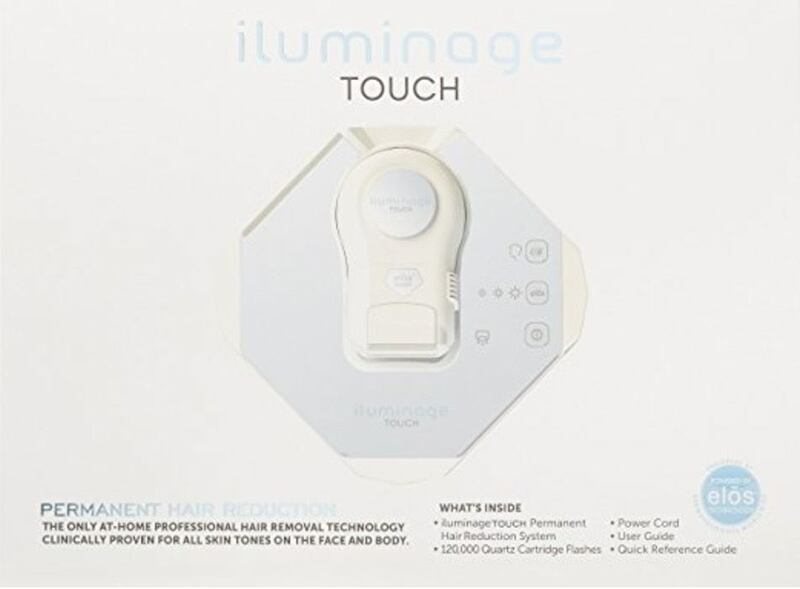 The iluminage Touch has two ways of removing the hair from your body. 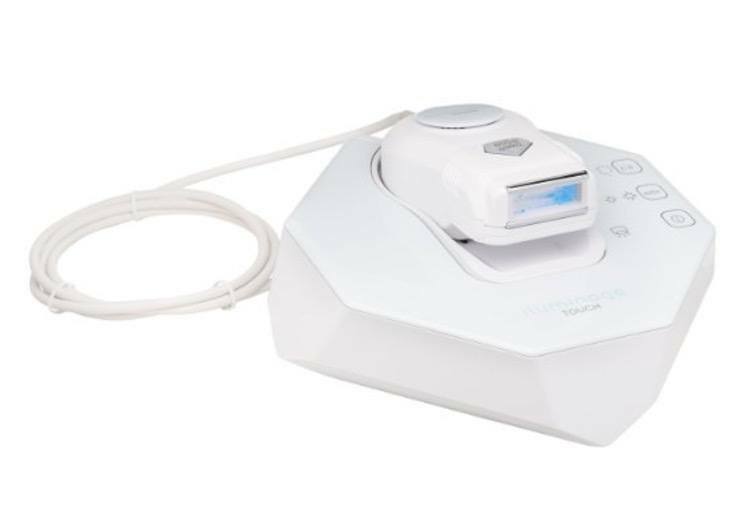 It uses radio frequency, or RF, and Intense Pulsed Light, or IPL, to better target each hair on the body. It works in stages. First, the energy of the IPL heats the hair follicle. This is where many laser treatments stop. They rely on the heat to destroy the follicle, but the iluminage Touch has another step. The RF is attracted to the heated hair follicle and provides even more heat to it. This means there’s a better chance of the follicle being destroyed with this treatment system. Does iluminage Hair Removal Work? Those who have used the hair removal system have seen almost 50% of the hair removed after only two treatments. After two months of treatments, users saw a reduction of almost 94% of the hair. Each cartridge is good for 30,000 charges, which means that you’ll need to replace the cartridge before you’ve hit that amount. If you’d like to get more pulses out of your cartridge, you can purchase a replacement cartridge with over 120,000 charges to it. This is a great option if you plan on having parties or sharing your device with friends and family. One of the biggest pluses to this system over others is the fact that it works on dark skin as well as light hair. Other systems aren’t able to tell the difference between dark hair and dark skin. They mostly look for the contrast between skin and hair, which is why light hair is problematic, too. With the iluminage Touch, there’s no problem with dark skin or light hair. They work equally well on many skin colors and hair types. As you can see from this video, the girl’s skin is fairly dark and her mom’s skin is, too. She’s happy with the results. While studies conducted by the company didn’t include gray hair, they say that there shouldn’t be a problem with gray hair since it works on blonde hair so well. The treatment area needs to be prepared before the device is used. This preparation will differ depending on the color of the hair and area to be treated. You’ll need to shave the area to be treated with the device to remove the visible hairs. The IPL and RF needs to penetrate into the follicle to destroy the hair bulb as well as the follicle root itself. Before every treatment, the area needs to be shaved. For light hair, you need to remove the hair completely from the follicle. This can be done with waxing or epilating. The heat has to be able to penetrate deep into the follicle bed, which can’t be done with light hair in the way of the IPL and RF energy. Check the level needed by starting on the lowest setting. While it shouldn’t hurt too much, there will be a lot of heat generated by the IPL and RF energy being directed at the skin. Wait a half hour to see how your skin reacts to the initial test. After testing the skin, pick a setting that works for you. Many people place the setting on medium with no problems at all. Press the applicator against your skin, so the contact bars are in contact with your skin. Once the connection is made, the applicator will emit a flash of light. Never look at the applicator as it flashes. It can cause serious damage to your vision. After each flash, slide the device along your skin to the next area. Once the device flashes, move on to the next until the entire area is complete. It’s a quick process. For smaller areas like the face, place the applicator against the skin and remove it after each flash. It’s vital that you wear protective eyewear while using the device near the face as well as other areas of the body. The iluminage Touch is a device that will work for light hair as well as dark skin. This option is FDA-approved for hair reduction on all skin tones and a wide range of hair colors including blonde and red.